Construction on the Palo Alto campus and on surrounding streets may cause inconvenience for many people, but the benefits will bring energy efficiency and better roadways. 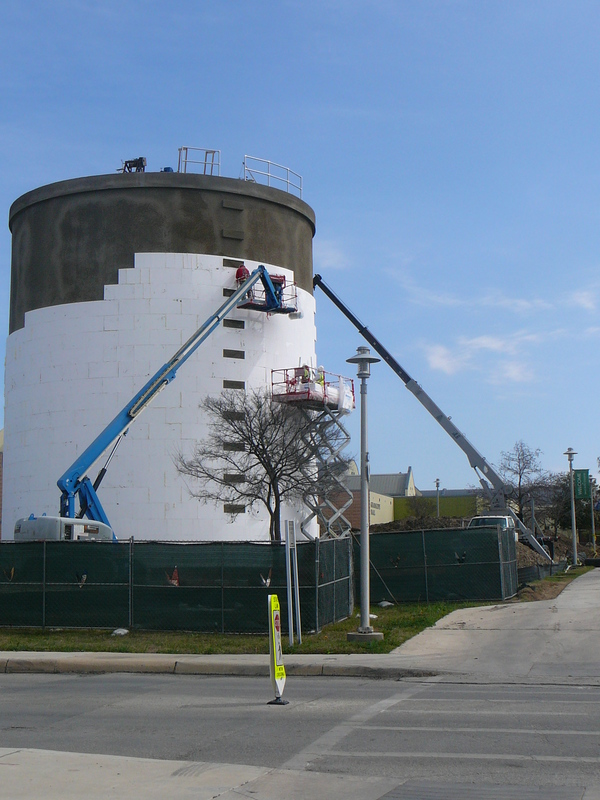 A Chilled Water Tower is being built to help Palo Alto College be more energy efficient. According to Sergio Rivera, Facilities superintendent, the purpose of the thermal storage tank is to store chilled water for use during peak times during the summer to save on electrical costs. “Normally we produce chilled water from one or both of our plants based on demand during the day. The thermal storage tank will enable us to produce that chilled water during off-peak hours, and store it for use during the day when electric rates can be more costly. The chilled water is used to provide cooling for the campus,” said Rivera. If you normally use the sidewalk south of Guadalupe heading toward Brazos Hall and Sabine Hall, then it’s safe to say that you have been affected by the water tower construction. The added time it takes to find a better route and the energy it takes to rush to the next class can cause difficulties for students, faculty and staff. “I used to be able to get to my next class in a timely manner. Now that I have to take the longer route, I find myself rushing from one class to the next. I get nervous that I will not make it on time,” said Caitlin Ryan, a sophomore Digital Arts major. The current date of substantial completion is April 23, 2014, just in time for PACfest. Until then, it’s best to use the sidewalk along Alamo Street or near the Executive Offices to access the west side of campus. As far as the construction happening on the surrounding streets, West Villaret Boulevard is currently being worked on by a contractor for the city of San Antonio. Although the temporary street closure created a burden for most who use those entrances, two lanes are now open for use. Part of Jennifer Street is currently closed, but is estimated to open back up on March 13, 2014. The Loop 410 entrance has remained open. Raquel Blanco-Ayala, administrative services specialist for TRIO Upward Bound, said she has had two flat tires in one month while driving on West Villaret Boulevard. Construction on West Villaret Boulevard is estimated to be complete on May 20, 2014. In regards to the first floor of the Ozuna Library, there is no scheduled time to complete construction. Rivera is hoping to re-start the project early next fiscal year. Another upcoming project will be a new high school, which focuses on college preparation. This is still in the exploration stage. The current location being looked at is the northeast side of the campus, off Jennifer Street. Rivera said he would like to thank the students, faculty and staff for their patience. ”Sometimes these sort of projects are disruptive to campus life. Every effort is being done … trying not to disrupt the educational process,” said Rivera.